Tomatoes, Onions, Cilantro, (Chili) Peppers, Lime & Avocado – in all or some combination they can be found in many a Mexican dish. They are essential building blocks in the awesomeness that is Mexican Food; each playing a distinctive part in achieving a cohesive balance of flavor. So, it makes sense to just combine all of the above and call it a day. Truth be told this is less a recipe and more a combining of deliciousness. You best believe, when tomatoes are in season – their flavors bursting with peak sweetness and pop – you should be cooking up something that involves the delicious red orbs. I’m not sure what you would call this. I’ve heard it referred to as Guacapico, which makes sense – but let’s not kid ourselves – your taking pico de gallo and adding some avocado. Das it. How could that not be good? I Think that’s good don’t you? And that’s what this is – just my pico de gallo recipe with diced avocado – with a one tiny changes, I use red onion for a peppery punch – but I don’t go overboard with it. It’s all about balance of flavor people! Note #1: Since avocados aren’t uniform in size (and pit sizes vary) it’s up to you just how much avocado you use. I use the whole thing regardless of the size. But feel free to use as much as you’d like. A lot of avocado isn’t a bad thing. Note #2: I find that it’s best to make your pico first and then dice and stir in your avocado before serving. It presents the avocado as it should be – as fresh and pillowy as possible. 3 Vine-ripened or 4 Roma Tomatoes – Seeded and diced. 1. Seed & Dice tomatoes. Add to a medium mixing bowl – sprinkle tomatoes with a bit of salt. Set aside. 2. 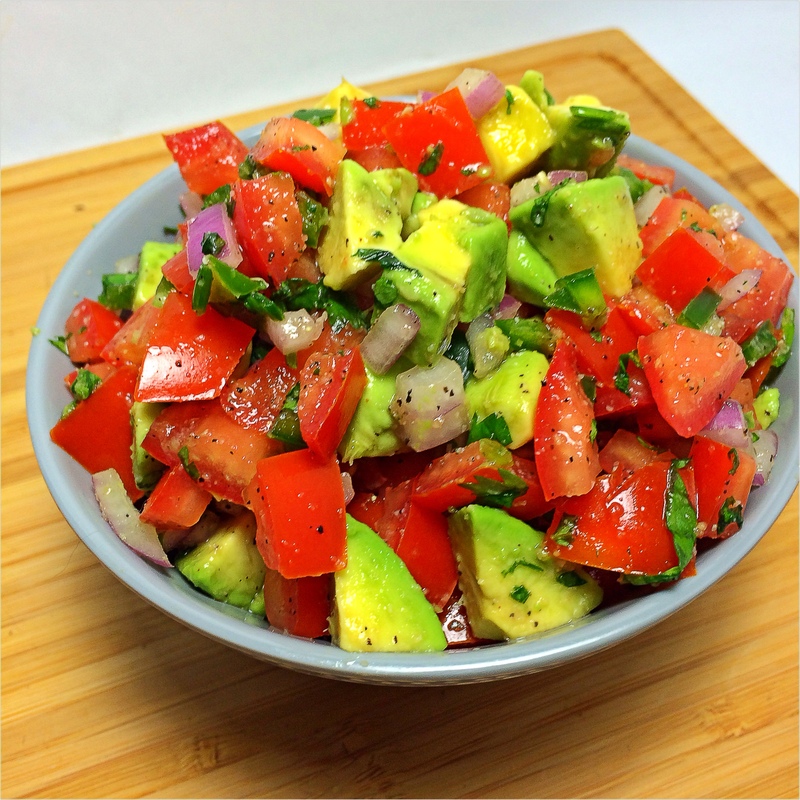 Chop all ingredients – except avocado – add to bowl of tomatoes. 4. Add garlic powder, black pepper and vinegar. 5. Stir evenly and thoroughly. 6. Add diced avocado and gently stir to mix.